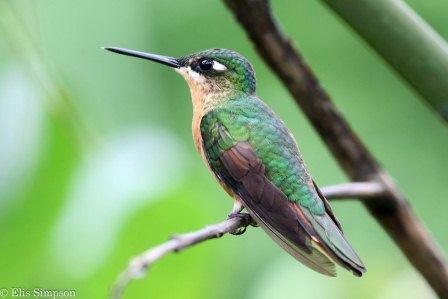 Festive Coquette / Topetinho-verde / Lophornis chalybea: This is one of the smallest Brazilian hummingbirds. 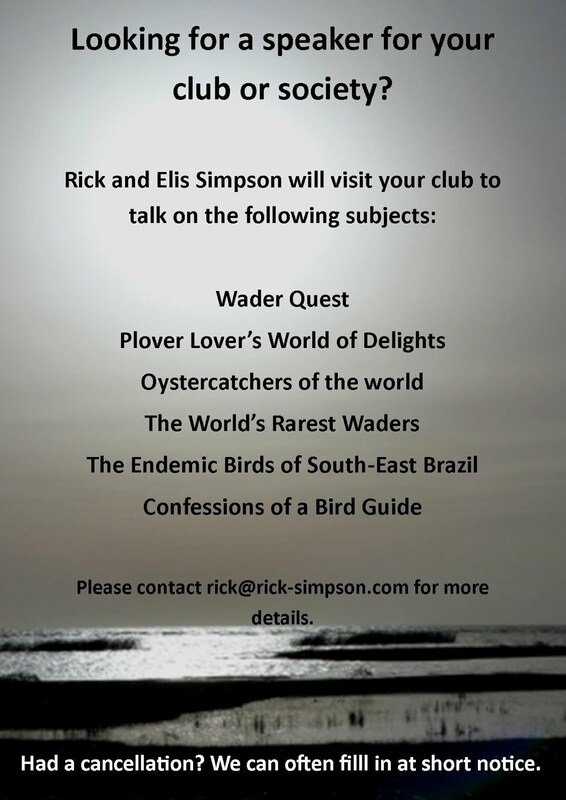 It is easy to see at feeders in the south-east of the country. The male displays by hovering in front of a perched female dancing from side to side with its magnificent frills splayed out. 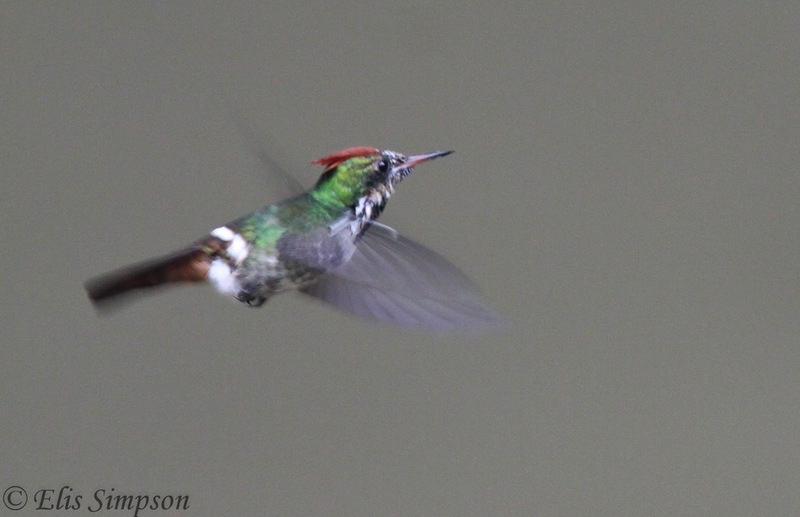 Festive Coquette breeding male showing off his incredible plumage. Brazilian Ruby / Beija-flor-rubi / Clytolaema rubricauda: As the name suggests this is a Brazilian endemic. 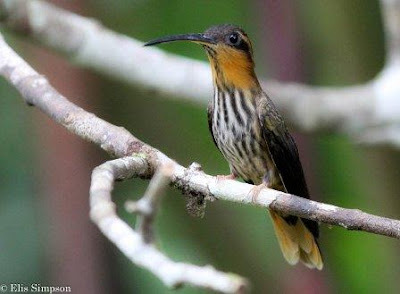 It occurs only along the south-east coastal region of Brazil in Atlantic forest habitat. Comes readily to feeders but you have to get the angle just right to see the colourful throat patch of the male. Personally I think the female is a more attractive bird all round. 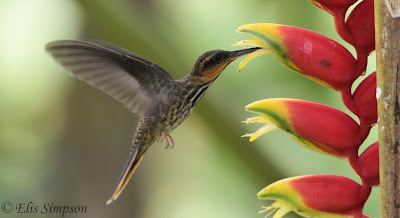 Reddish Hermit / Rabo-branco-rubro / Phaethornis ruber: One of the real forest dwellers that seldom comes to feeders. It is very small and can easily be missed, but its bumble-bee hum is quite disticnctive along the forest paths. It will sit still and sing for long periiods, but its diminuitive size can make it hard to spot in the tangled forest foliage. Once found it can be observed and photographed for lengthy periods. Its song is a squeaky twittering that is quite pleasing to the ear and several of them will sing simultaneously in a loose lek covering a small part of the forest. Stripe-breasted Starthroat / Bico-reto-de-banda-branca / Heliomaster squamosus: This is a bird that is not common along the coast. Indeed there have only been two records of it in Ubatub and Elis found both of them. The first was a sight record only but the second was the female bird below that she found and photographed at Jonas' house. The male is a stunning bird, this one was captured sitting on the mother-in-law's washing line. Frilled Coquette / Topetinho-vermelho / Lophornis magnificus: This species was sometime quite easy to find at Itatiaia where if frequented feeders but it was by no means always so. Down on the coast it appeared most years in Spring for a few days so was presumably a passage migrant there. This is a male taken on the coast, it is not quite in full breeding plumage. Black-breasted Plovercrest / Beija-flor-de-topete / Stephanoxis lalandi: A bird of the highlands that we saw along the Agulhas Negras road in Itatiaia on a regular basis; however the easiest place by far to see it was at feeders in the garden of the Tres Pinheiros pousada (B+B) in Campos do Jordão. The feeders cannot be seen from the road but it is well worth staying there just to see this bird so well and up close. The female lacks the crest, bluish crown and the black bib. 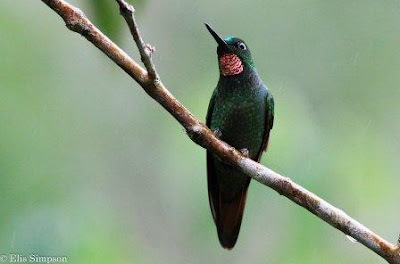 Saw-billed Hermit / Beija-flor-rajado / Ramphodon naevius: Probably the most observable hummingbird in the Atlantic forest. The squeaks and calls of this bird seem to be audible the whole time one is walking the trails. Occasionally it will flash past you along the track but is always hard to see well. Unless that is you visit the feeders at Folha Seca. Here you can see them almost constantly and get stunning close-up views of them. They will often hover in front of your face just to check you out. Here it is possible to study them well and to be able to see the differing bills of the males and females. The males bill is straight and has a small hook at tip, the female has a slightly down-curved bill and no hook. These noisy. lively and large hummers can give endless amusement as they chase each other around the feeders and gardens, often perching to allow excellent views and photography. 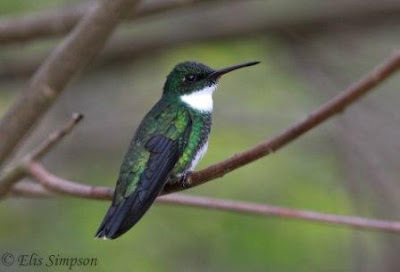 White-throated Hummingbird / Beija-for-de-papo-branco / Leucochloris albicollis: Another highland bird that occasionally found its way down to the coast. This handsome beast was really easy to see anywhere in high ground, its distinctive song was far reaching and often gave away its presence. 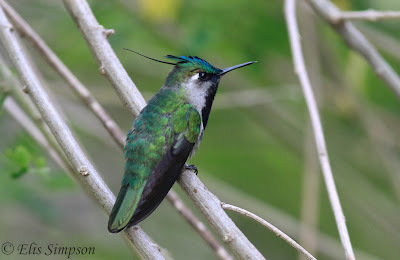 White-chinned Sapphire / Beija-flor-roxo / Hylocharis cyanus: Probably the most inappropriately named hummer of the region. There are one or two miniscule white feathers on the chin of this bird, but yu'd be hard pressed to see them. When you do see this bird the most striking thing you'll notice will be the blood-red bill with a black tip. This little bird likes to sit and sing from bare branches at the forest edge and along trails. It can often be very hard to find due to its size and its habit iof remianing high in the canopy. When it comes down to feeders at eye level its true beauty can be seen. The female is much less impressive and can sometime cause confusion with other species.